In order to put together a successful online store, you need to choose the right ecommerce platform. With several options available in the market, it can be challenging to decide which one is best for your business goals. We have already talked about Woocommerce vs Shopify, and today we are making a comparison between PrestaShop and Magento. Both platforms come up with their strengths and limitations. Choosing between them isn’t easy. So, how can you make the right decision? With our extensive PrestaShop vs Magento Comparison, you will be able to figure out which is the option that best suits your ecommerce needs. First, let’s have a quick look at what both platforms have to offer. Launched in 2007, PrestaShop is a popular open-source eCommerce CMS (content management system) which comes with plenty of impressive features. It is an ideal option for small to mid-size businesses looking to gain a strong online presence. PrestaShop allows you to build a fully customizable, up-to-date online store without any license fees or revenue percentages. It also comes with some advanced features such as eCommerce Analytics, Forecasting, and Intelligent Merchant KPI. With PrestaShop, you get a basic setup for free; however, you need to buy themes, templates, and modules. Founded in 2001, Magento is known as one of the best ecommerce platforms that offer extensive features for tech-savvy retailers. It is an ideal option for professionals looking to launch a fully-functional online store with advanced features and excellent support. It can be integrated with multiple payment options while supporting different currencies. Magento is an open-source platform with extensive plug-in architecture which allows you to customize the code in order to boost the functionality of your store. 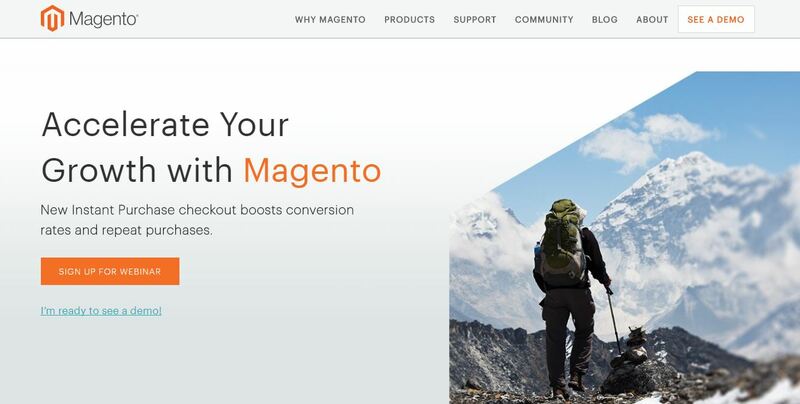 With a wide range of third-party integrations and better SEO benefits, you can use Magento as a catalog-management tool. Now that we got to know the two brands’ general characteristics, let’s go over some specific points to check where their strengths and limitations rely on. You can easily install PrestaShop without having to hold expert knowledge of the platform. Besides, it’s not difficult to find a suitable hosting and install the setup itself. When you have built your online store, the daily activities seem to be relatively easy thanks to its simplistic Admin panel. PrestaShop also provides tons of add-on modules which improves the functionality of your eCommerce website. Moreover, PrestaShop comes with a modern dashboard which offers quick access to all the required store performance details and settings. If you don’t have an experience of using CMS, then you are going to find Magento installation a bit complex. Besides, you may need to hire a Magento developer to customize the look and functionality of the store as per your needs. But, Magento will help you build a user-friendly and fully-functional eCommerce website. If you spend some time understanding the basics of this platform, you will be able to manage your store with ease. Being an open-source code platform, Magento provides a free software solution with a lot of advanced features. PrestaShop is an open-source application which is available for free. In order to come up with a fully-featured online store, you only need to download its setup and install on your paid web hosting account. You can also choose PrestaShop promoted hosting partners who offer reliable hosting service at USD 7,99 to USD 14,99 per month. To improve the look and functionality of your website, you will further need to purchase the template and modules. Magento is also an open-source code software which is available for free. Mainly, it has three editions; Community Edition, Magento Go, and Magento Enterprise Edition. The community edition is available for free to download and install. In most cases, you may need to purchase extensions and third-party plugins. The Magento Go starts at a monthly fee varying from USD 15 to USD 125 based on the number of admins, SKUs, languages, the amount of storage and the level of support. Besides, the license cost of Magento 2 Enterprise Edition starts at USD 22,000.00 which is solely designed for the biggest players and large enterprises. With PrestaShop, you get the reliable support of community which consists more than 700,000 enthusiastic users and professionals. You need to join the online community which is active on various help forums on a regular basis. All the forums are well-documented, and also available in French. Moreover, you can choose different support plans which will help you get different levels of support. The support plan starts at USD 249 per month for 3 hours of support, or you can pay USD 399 per year for a one-year subscription. With Magento Community Edition, you get the reliable support from the community consists enthusiastic web developers and professional experts. You can contact them anytime using different online forums. Moreover, if you are using the Enterprise Edition, you will receive official support. Users admire Magento for its highly professional support which is available all-time. PrestaShop comes with a lightweight and easy-to-use admin panel, making it easy to manage the website. It provides a seamless experience to the website owners and customers as well. PrestaShop allows you to personalize eCommerce store as per your needs and customer’s preferences using admin panel. All required information is available in its easy-to-use dashboard. Magento is an ideal option for product editing and capable of managing a huge database smartly. However, it requires the high-end infrastructure and fast hosting. You can always speed up the backend and website by choosing the most appropriate hosting, merging CSS & JS Files, and enabling flat categories/products or compilation. PrestaShop comes with some basic search engine optimization (SEO) possibilities. If you want your upcoming online store to attract adequately high traffic, you need to pay attention to search engine optimization. You also need to think about website responsiveness since Google also considers whether your site is mobile-friendly or not. Earlier, PrestaShop did not offer responsive layouts by default, but today it does. Every PrestaShop layout or template is well optimized for all kind of platforms and devices. Magento is known for providing some strong SEO opportunities as no other e-commerce platform does. The platform has been providing responsive layouts since 2014; it is well optimized any kind of browser, platform, and device. Used as a catalog-management tool, Magento is more powerful in terms of SEO while comparing to PrestaShop and other platforms. With 2 free and 1000+ paid themes, PrestaShop is a fully responsive system which allows you to develop a professionally-designed eCommerce website. Each theme or template can be customized as per your needs and preferences. All the templates are well organized into different categories according to different store types so you can easily choose the most suitable one. There are 1500+ free/paid beautiful Magento themes available that can be customized as per your needs. All the themes are fully responsive and work flawlessly on all kind of platforms and browsers. You can add more features and advanced functionalities without disrupting the look and feel of your store. Both ecommerce platforms are highly flexible, efficient, and scalable. It is difficult to state which one is better. Startups, small businesses or those looking for an easy-to-use platform will find PrestaShop a better fit. On the contrary, Magento is an ideal option for those who want full control over the customization of their website. Larger businesses or those planning to come up with more reliable and feature-rich platform will find Magento a better option than PrestaShop. 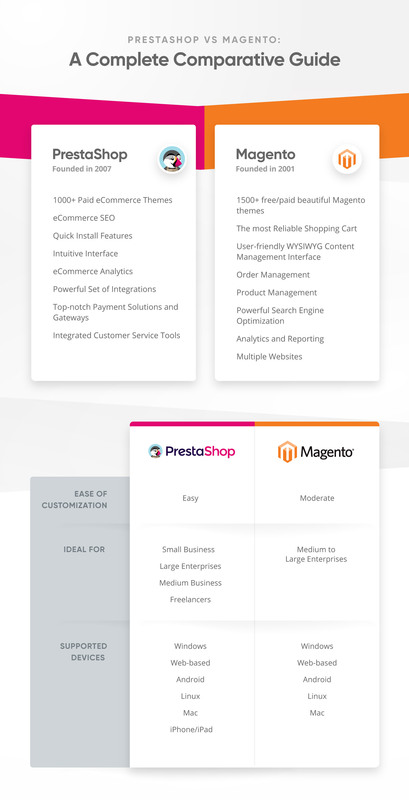 Hope our comprehensive PrestaShop vs Magento comparison will help you pick the best platform. Remember, choosing which option is right for your business is going to depend on your preferences, budget, future plans, and familiarity with the platform. Get to know all the features the EBANX Payment Gateway for Magento has to offer.